While we’re usually pretty good at matching a genre to bands, there are some groups who defy a simple explanation. The experimental, psychedelic, electronic, dance, synth- and glam-pop group Of Montreal from Athens, GA is one such example. While we’re big fans of the band, their sound is difficult to put into words. They combine a little of just about every genre to create a sound that is uniquely their own. Their live shows are theatrical, reminiscent of the glam kings of yesteryear like David Bowie. Their lyrics are abstract yet at times lucid. Their music is chaotic and frenzied yet controlled and meticulous. 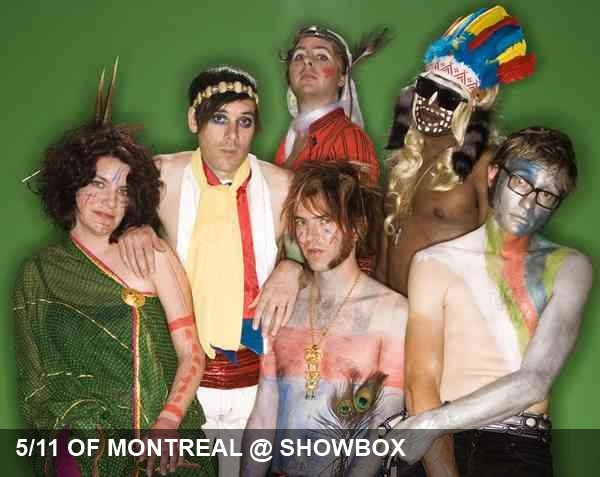 Of Montreal are as much a treat for your eyes as they are for your ears. This is definitely a show for people who want to dance, especially considering openers Painted Palms and Beat Connection.